I purchased this dress six months ago from Still White, but unfortunately it no longer fits me. I absolutely loved it and am sad to see it go. The only photos I have is a photo of myself when I tried the dress on, the other images are from the Johanna Johnson website. I have reduced the price, but I'm also open to offers as I'm moving house in the next few weeks and I won't have anywhere to store it. I have posted the sellers original message below. 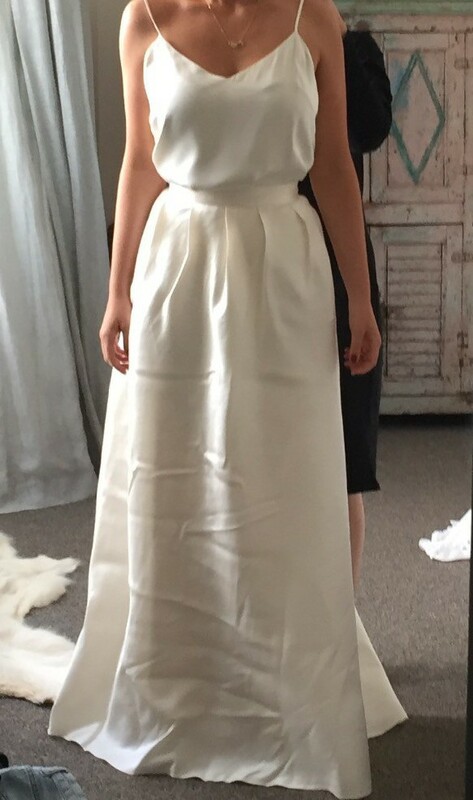 Approx size 10, but has been altered to fit me. Therefore, as with all wedding gowns, it will need to be taken to a good tailor to be altered to your body shape and size. And I can recommend the BEST tailor - Meg at Meg's Tailoring. Silk Cami UNWORN as I ended up wearing something different on top. Skirt worn once, dry-cleaned professionally at Regal Drycleaners and packaged in special storage box. The most beautiful fabric and so comfortable. I absolutely LOVED wearing it! The cami looks hot with the skirt, however I had to change the look, as I became too concerned about being cold.